The elaborate stucco ceiling in the small dining room of Mount Vernon is thought by many to be one of the finest examples of plaster decoration known to its period. George Washington gave explicit directions regarding the ceiling, calling for exquisitely graceful ornamentation, which involved finding craftsmen who would fulfill Washington's expectation to the finest detail. At the center of the ceiling is a beautiful rosette, surrounded by a wheel of heavy stucco foliage. Encircling this is a garland-like pattern, whose points serve as a tradition to the finer foliage bordering the ceiling. 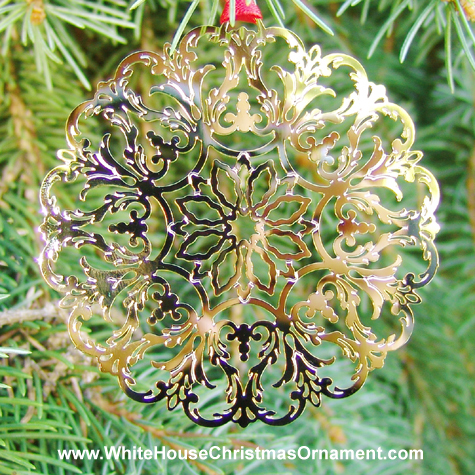 The impression of simple, understated elegance, which many feel is a reflection of George Washington himself, is captured in this 24-karat gold-finished brass ornament.